Broad-leaved Helleborine is common throughout its range and grows in dark woodlands, quite often appearing very close to well trodden paths. Coniferous and Beech woodlands are particularly good for Epipactis helleborine. Far less common is this white-flowered variety Epipactis helleborine var. albifolia, as also is the purple flowered Epipactis helleborine var. purpurea and the Green-flowered variety Epipactis helleborine var. viridiflora. Epipactis helleborine var. 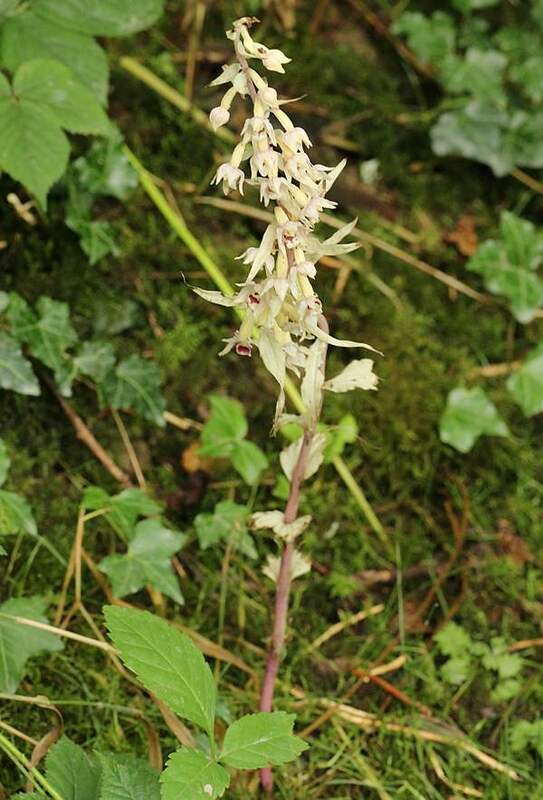 albifolia differs from other kinds of Broad-leaved Helleborine in both its flowers and its leaves, which are predominantly white (although pale pink flowers are also recorded). Lacking in green pigment which would enable it to photsynthesise, it this orchid is probably dependent throughout most if not all its life on a symbiotic relationship with mycrorrhizal fungi in the soil. The plants shown on this page were found in Deep Hayes Country Park in Staffordshire. 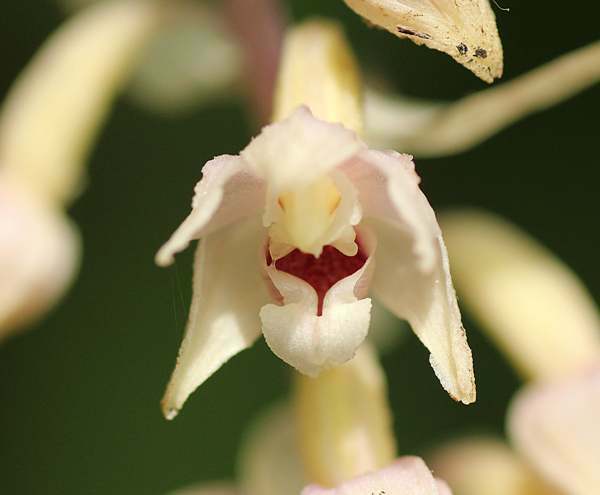 Because of its rarity it is difficult to form an opinion as to where else in Britain this orchid may appear. The specimens pictured here were found in mixed deciduous woodland.